For Connected Courses (#ccourses), I had posted something about the Storybook project, so I thought I should start the arduous task of documenting that project here too. It's the heart and soul of my classes, and there's so much I want to say about it. For an attempt at an overview, see the Connected Courses post: Why? Writing! BRIEF DESCRIPTION. The Storybook is a semester-long project in which each student chooses a topic related to the class, finds traditional stories on that topic, and then retells those stories in their own style. They publish the Storybook as a website, and the students share and comment on their Storybook projects week by week. 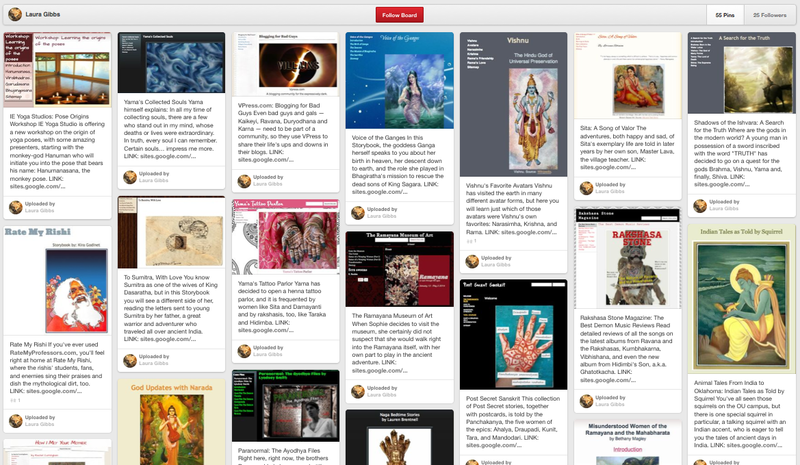 You can see an archive of past projects here: Myth-Folklore and Indian Epics. DETAILS. There is so much I will need to say about the Storybooks, but for an overview, take a look at the week by week assignments which you can see here: Weekly Storybook Assignments. As you can see, there is an alternate project called the Writing Portfolio. That is something new for Fall 2014, so I will write up something about that separately when I see how many people choose the Portfolio option. It's totally new and I have no idea what to expect. The Storybook project begins already in the first week when students browse through the archive of past project, looking for ideas and inspiration: Storybook Favorites. There then follow two weeks of brainstorming, divided (somewhat artificially) between brainstorming about Storybook Topics and Storybook Styles. I will write up separate posts explaining how those assignments work. Then, in Week 4, students should be ready to write their Introduction, based on the plan that has emerged from the two weeks of brainstorming. Based on that Introduction, they then make their choice: carry on with the Storybook project, or switch to the Portfolio instead. After the website and Introduction are both online, students then start reading and commenting on each other's projects; I'll have more to say about that in a separate post. You can see the projects for the current semester here: Myth-Folklore and Indian Epics. I also keep Pinterest Boards for the Storybooks! The rest of the semester consists of alternating weeks of writing and revision as students add new stories to their Storybook and then revise those stories. I'll have something to say about the writing-and-revision process in a separate post. The schedule is flexible so that if a student misses a weekly Storybook assignment, they can still carry on after having missed a week. I'll explain more about the alternate schedules in a separate post. The alternate schedules are an important part of how the project works: it's a demanding project, and while I want the students to work on the project every week, I totally understand that there might be times in the semester when that is just not possible. At the end of the semester, students nominate their favorite Storybooks and we have a ballot, just for fun, where they vote on the most-nominated Storybooks for the best-of-semester projects. I'll say more about that in a separate post also. I've used the Storybook approach since I first started teaching online. In fact, one of my biggest motivations for wanting to teach online was to make the students' websites the natural focal point of the class. When I first started, I very naively did not have a cycle of writing-and-revision. Instead, I asked the students to add a new story every week while revising their previous story at the same time. 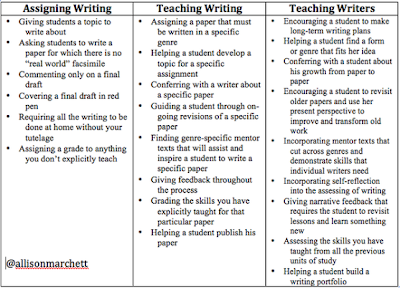 That worked for some students, but many students needed more help with their writing, so starting in the second year, I switched to the alternating weeks of writing and revision. The next year, I created the alternate schedules to help students see how they could stay on track even when missing some of the weekly assignments. As for the websites themselves, the students originally published them in webspace (4MB) provided by the university, using Netscape Composer (later Mozilla Seamonkey) to create their pages and upload them with FTP. Then, without warning, my school deleted hundreds of student projects from the archive. It was the single greatest setback I have ever experienced as an online instructor; I spent Sunday, August 15, 2010, literally in tears as I clicked through one broken link after another after another, realizing that hundreds of websites had simply vanished overnight, just a few days before the start of the Fall semester. Luckily, some of my students had been experimenting already with Google Sites as a publishing alternative (for students working in computer labs, a 100% browser-based option was much more convenient), so starting in Fall 2010, students began publishing with Google Sites. That is why my archive of past projects only goes back to Fall 2010, and it is also why I will find it hard ever to really trust my university again for any kind of web hosting. I cannot begin to describe my enormous satisfaction with the Storybooks. They are a pleasure to read, and watching the students create the Storybooks every semester is like watching a magic show as they summon the Storybooks out of nothingness using the magic wand of the imagination. Even though I have taught these courses for over 10 years and have seen now what must be over 2000 Storybooks, each semester always brings new topics, new styles, new approaches that no one has ever tried before. As a teacher, I had always believed in each student's creative powers as an abstract principle, but the Storybook project has demonstrated that principle in action year after year after year: the students' creative powers are awesome. Every semester, there are Storybooks that make a huge impression on me, stories and styles that I will never forget. Even more important: the students have the same experience too, being surprised and delighted by their own creativity while also reveling in the creative powers of their fellow students. The Storybook project has been a great experience for me not just as a teacher, but just as a person; these projects are an important part of my life. Plus, it's a very flexible type of project: I would urge anyone who is looking for a writing-based semester-long project to give it a try. I'm sure it could be adapted to just about any class where the students are reading and writing and sharing their work!